The last part of the afternoon was spent once again with a number of different demonstrations and dances. 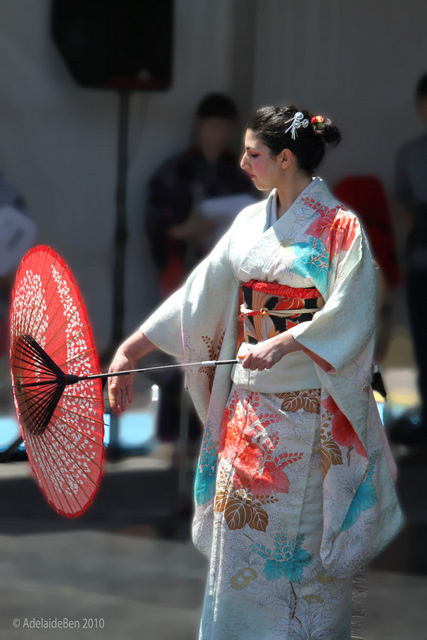 One of the more stunning was a beautiful display of grace and poise as part of an umbrella dance... showing that the arts (and fun) of Japanese culture are not limited only to the Japanese. This dance was very very well executed, each like a controlled expression of flexibility, strength and control. 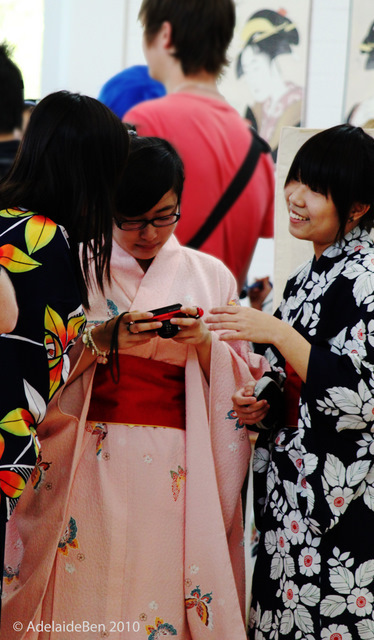 There was also a session on kimono wearing - though for an Australian context, the kimono were largely replaced with yukata which is a more informal "summer" dress. 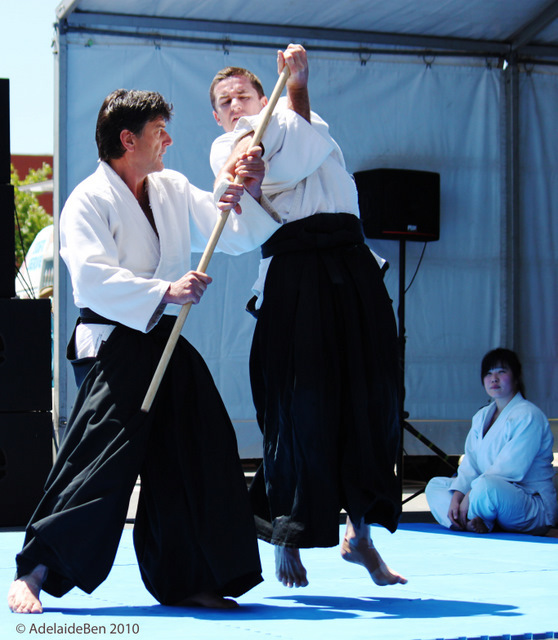 And there were more martial arts demonstrations... including aikido... which is a blend of martial arts and philosophical-religious system that is roughly translated as the "way of the harmonious spirit". Actually, this is a relatively recent martial art developed by the fusion of Daitō-ryū aiki-jūjutsu and the religious beliefs based on Ōmoto-kyō (which is closely related to Shinto). The martial art was developed by the founder, Morihei Ueshiba, in the 1920's. There's something to be said for the system of using your attacker's strength against them... though at times it looked anything but harmonious. Of course there could be no Japanese festa without a tea ceremony (ok - if you hadn't worked it out by now, festa is the Japanglish for festival). Here a number of the crowd were given the opportunity to sample some delicious Japanese matcha (a thick green tea). 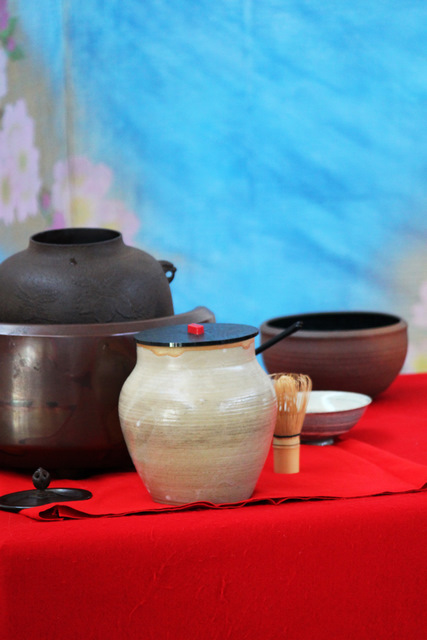 The tea ceremony (known as chadō) dates back originally to the introduction of tea into Japan in the 9th century - but today's ceremony harks back to the Zen practices of the 15th century. It's meant to be conducted in a place of quietness... not possible in a giant sports hall filled with lots of kids and parents running around. Still - it was enjoyed by all those that watched. T-chan makes a rare appearance in this photo of L-kun... the good thing about this festival is that it's located alongside a school with a very nice playground... a great space for L-kun to run off some steam. And the yakitori he had for lunch. 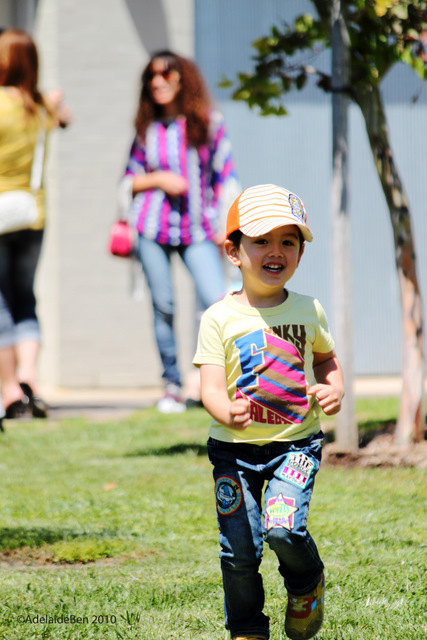 L-kun loves playgrounds, and whilst he was a very good boy (until the end), he comes alive when he can play. 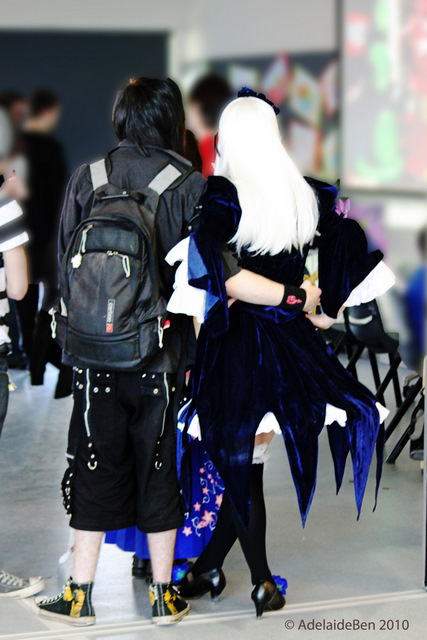 Adelaide doesn't have a large cosplay community, however, they do make the most of their opportunities. There was actually a whole demonstration based on this... but the participants were intimately connected to the AVCON (Anime and Video-games Convention) group in Adelaide. They certainly added a great deal of interest and colour to the proceedings... and were a focal point. Final Fantasy was a popular theme as always. 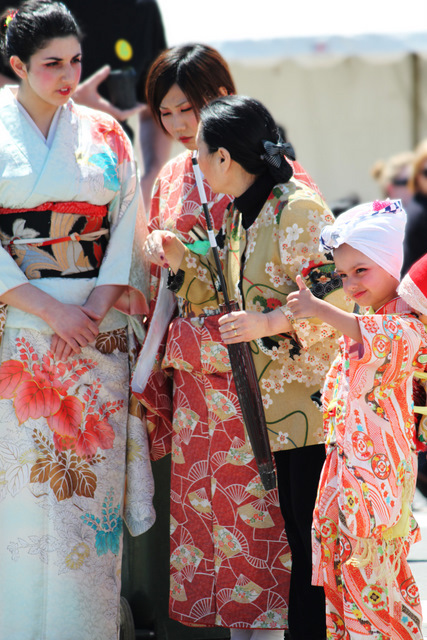 These sorts of events are all about communities coming together... Japanese communities as well as Australian. There's something nice in the moments we share, and indeed the pictures (those moments captured in time) that suddenly transition between the instant and the immortal. As time goes on, we find ourselves rapidly defining our lives in the moments captured in bits and bytes on our computer... one of the many challenges to our free time in our modern lives. 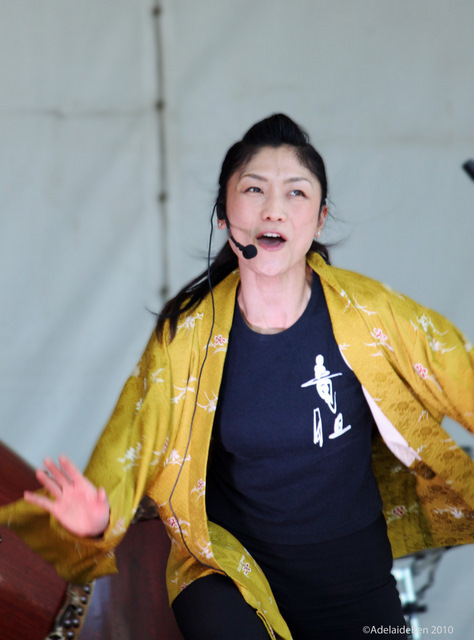 We had to head out before the final event (the taiko drumming) but for us a very fitting finale was the return of Noriko Tanabe who performed again on the Shamisen giving some of her modern interpretations (and even gave some lessons on stage). She also gave an impromptu lesson on Sōran Bushi, a traditional matsuri dance based on the work of Japanese fisher-peoples. 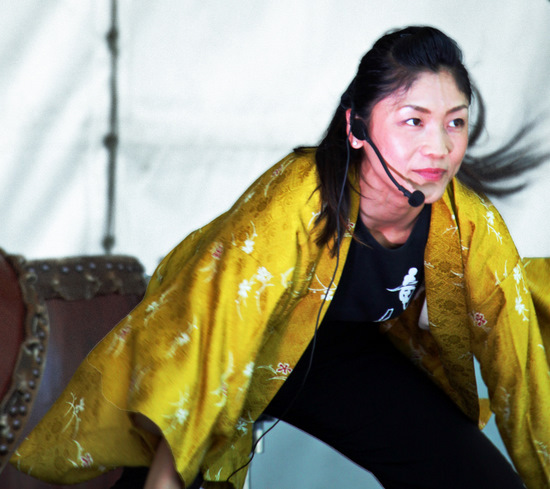 This dance goes back a long way in Japan... an ancient precursor to Zumba. Whilst it was a complicated affair for those brave enough to go to the front, it was both a lively and fun way of ending the day. 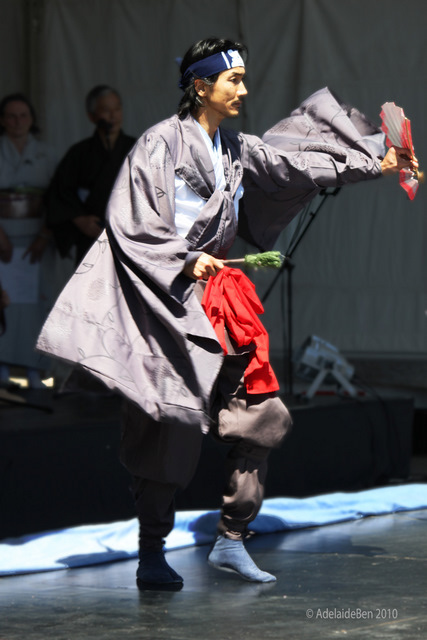 This song/dance is often accompanies bon dances... the summer ancestral spirit festival in Japan. It was a good day... but alas it ended in some tears as L-kun missed out on getting his face painted. It's hard explaining to a 3 year old why they would say no (when the booth closed... with us next in line). 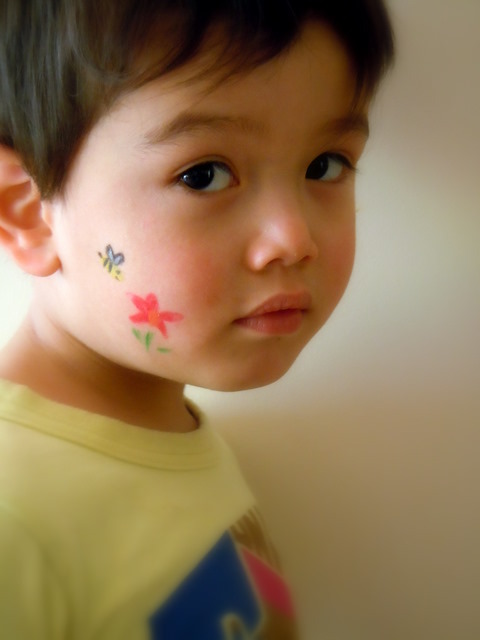 Even though he didn't like face-painting before, he was very upset now that he couldn't do it. As a result, we decided that perhaps it was a good time to call the day to an end - so we missed the taiko drums. So whilst L-kun missed out on his face painting... T-chan obliged with a beautiful set of home-drawn images. I was planning to tell you that I think your photos are great. The colors come out so pretty. But then I just saw this last photo of L-kun and WOW! That is an amazing photo! I wish I could take photos like that! 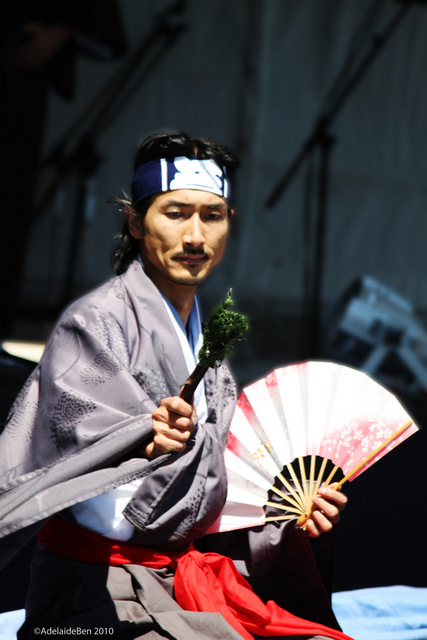 Great job covering the matsuri. Thanks for that.. luck plays a part as well (that and persistence). I'm sure our son gets a bit frustrated (what Daddy... more photos!) Still, he's pretty well a ham-actor as well, so he enjoys the attention most of the time. As for photos... I'm still trying to work out how to take photos. Hard work. But I think I'm getting better. My wife still has a better eye for taking photos though. Introducing My Son, L-kun... Hajimemashite!